As I mentioned in my Citron rice post, one of our relatives used to send citron and citron leaves from their backyard tree and it has been continuing even now. 😃 From this time batch, I made rice and rasam apart from making pickle. I extracted the juice to use in this recipe and I used the peel to make pachadi. so, if you are making this recipe, make sure to save the peel for making pachadi. Do not waste the peel. 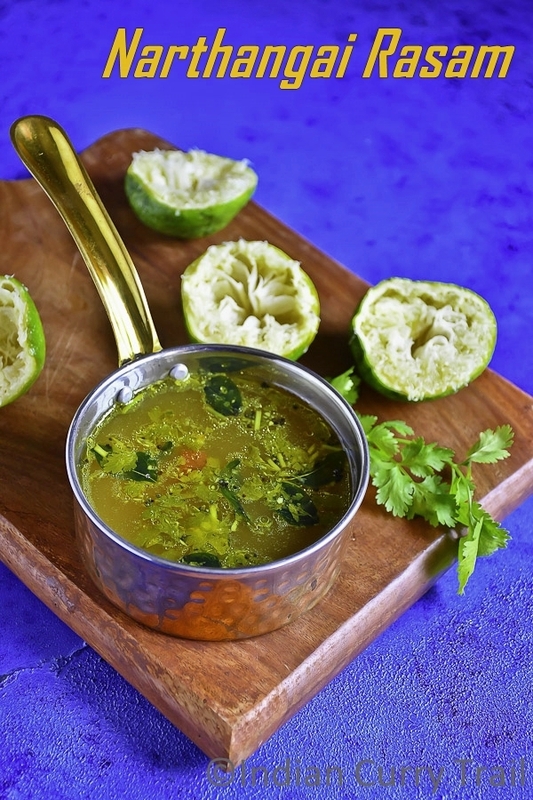 Citron is the excellent source of immune boosting vitamin c. This rasam is best to consume during winter/cold or flu season. I also made the Narthangai leaf powder using the leaves she sent. I will make a detailed post on it in few days. I tried my level best to capture the cooking process as video and attached below. Please view and make sure to comment and subscribe it. Thank you! 1. Cut the citron into two and squeeze out the juice from it. Keep aside. I got 1/4 cup juice from 1 citron. 2. In a mixer jar, add all the ingredients given under "For Grinding" to a coarse powder. keep aside. 4. Using the hand, squeeze out the juice from tomato until you don't see any trace of tomato pulp. 5. Now, add in the ground ingredients to the tomato juice. mix well and place it on the stove. 6. Add salt. 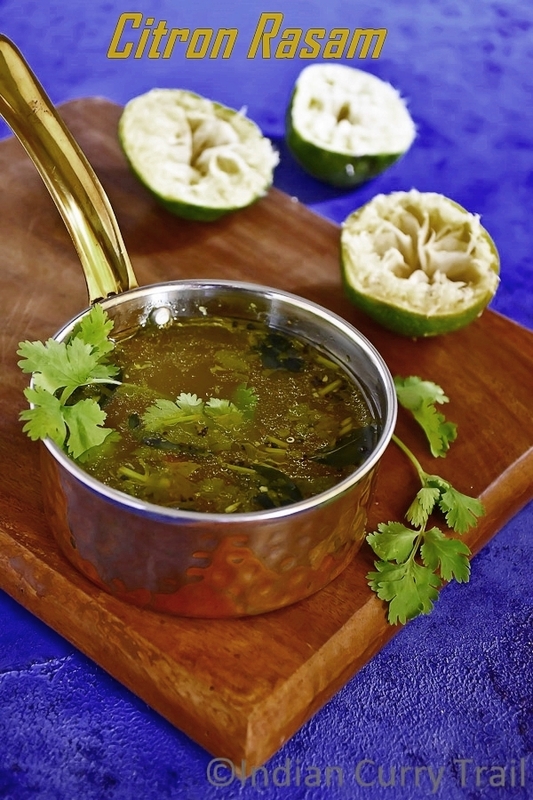 When it boils, turn off the flame, add rest of the coriander leaves,curry leaves and asafoetida. 7. 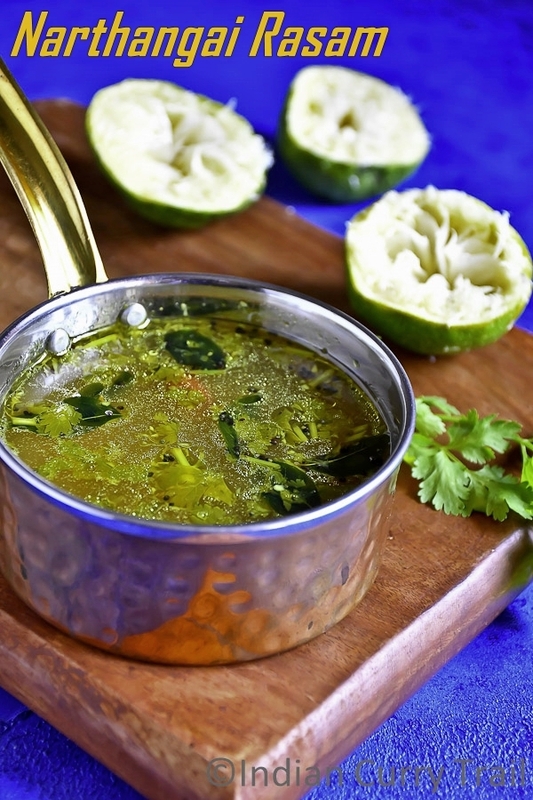 Filter the seeds from citron juice and add it to the rasam. Mix well. 8. In a seasoning pan, heat oil. When it smokes, add the mustard seeds, fenugreek seeds and let it splutter. Add curry leaves and let it becomes crisp. 9. Add this seasoning to the rasam. 1) Adjust the water according to the sourness of the citron juice. 2) Make sure to add the citron juice only after turning off the flame. 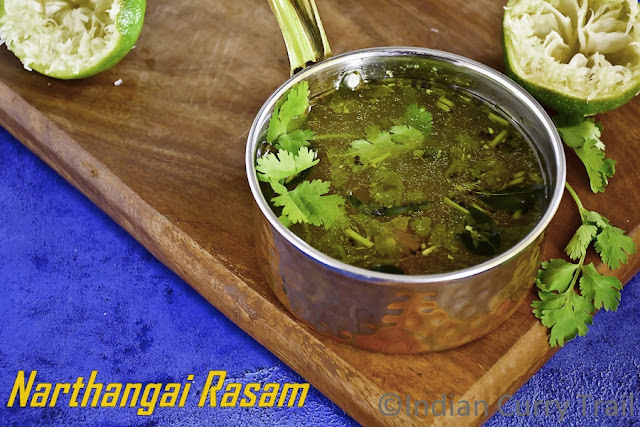 3) If you are using eeya chatti(tin coated vessel) for making rasam, then no not roll boil the rasam but keep rasam in low flame till it is frothy and add the salt and citron juice at the end after turning the flame off.